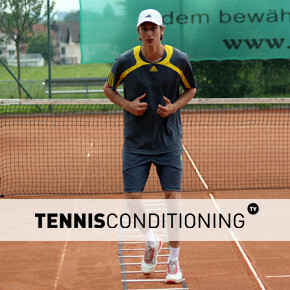 Tennis circuit training is one of the best overall strength & conditioning drills you can do because it touches on every single aspect of training. Circuit training can be defined as a form of strength and conditioning training for all kinds of athletes using a bunch of exercises in a row and various training intensities with short rest intervals to achieve a specific training goal. With caloric expenditure your focus is on total work performed. Work can be defined as force times distance (Work = force x distance; (force =m x a ⇒ m x a x d). So you are basically looking at your activities and you want to produce as much force as you can through a full range of motion in the highest amount of volume in the shortest period of time. But that takes a toll on your physical capabilities because if you make that effort too hard then you fatigue before the next exercise commences because you cannot clear enough lactic acid if you are not in good shape. In other words, it takes some time to buffer lactic acid to lactate and then clear it through all the cells. If you are in very good condition then the lactic acid clearance doesn’t take a lot of time but if you are not in good shape then it will take a lot of time and that would defeat the purpose of circuit training. Therefore, you have to pay close attention to exercise intensities and rest intervals! Reduction in fat mass has to do with caloric expenditure. When you focus on reduction of mass then many people think they need to train at lower intensities to be in the “fat burning” zone. But that’s inaccurate because lower intensities also means lower caloric output and in order to lose fat you need to have a negative caloric balance, right? When you have your athletes working out in the fat burning zone with your programming then you wind up barely losing any calories and if they don’t lose any calories then they don’t burn any fat. Find out How Much Fat Can You Lose In A Week. If you want to burn the highest percentage of calories from fat then you have to sleep a lot since a normal size person will burn about 50 calories per pound of bodyweight per hour, which is more than working out in the “fat burning zone” and I’m sure people rather sleep than work out. How do we encourage an increase in lean mass? By working at 70% – 80% of 1 RM at a high volume, which is basically the lower end of bodybuilding. If that’s your main goal take a look at How to Gain Muscle Mass for more information. 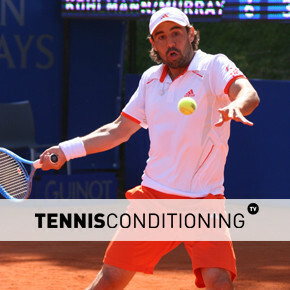 When you are working out at these volumes and intensities training becomes very draining and you have to adjust overall training volumes and intensities during tennis training as well, otherwise you’ll overtrain your athletes. Knowing your 1 repetition maximum (1RM) is very important for programming purposes so you can train effectively and maximize your performance potential. 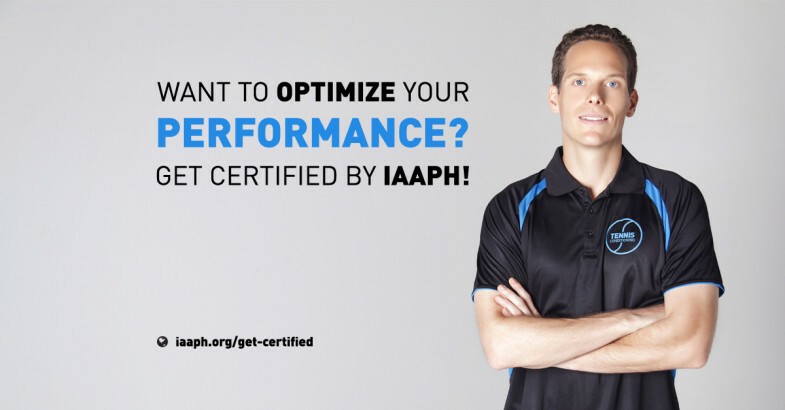 Get more information on why it’s important, how to calculate it, including an example, and how to predict exercise intensities: 1 Repetition Maximum: How to Predict Exercise Intensity. So, you could do circuits in similar fashion but you have to be smart about it. You probably want to adjust the circuits so you have very good balance between the muscle activity you engaged in because you cannot use the same stabilizers twice, can you? Rest intervals are usually transitional, meaning you move from one exercise to the next, which means they are generally between 10 and 15 seconds. For cardiovascular improvements you use short rest intervals or transitional rest intervals and intensities are pretty moderate because you need to continuously go. You cannot use something that has a too high intensity because then the transitions cannot be 10 seconds. If you have 8 exercises to do in a row and intensities are too high then you cannot go and use the 10 seconds to do the next exercise. What are you going to do? You have to breath to clear up the lactic acid, which means you cannot do the following exercise correctly. So you screw up better cardiovascular improvements by maintenance of heart rate…awesome! Body composition can be defined as the ratio between lean mass and non-lean (fat) mass. Since it’s a ratio, it allows you to improve overall body composition by increasing muscle mass (lean mass). The total duration of the circuit(s) shouldn’t be over 30 minutes. The rest intervals between circuits are generally 1-2 minutes so you can clear your system, rephosphorylate and do it again. For more information on energy system dynamics take a look at Biological Energy Metabolism: ATP Production. If you deal with very fit athletes rest intervals between circuits can be 45 seconds but for deconditioned athletes it can be up to 3 minutes. When you use resistance training for aerobic activities, the 1st circuit is for cardiovascular training but if you use intensities that are too high for the circuit training than you work anaerobically. So what percentage of 1RM are you going to use when you circuit train? First you have to determine how long the actual interval is going to last (1 minute is usually pretty good) and then you have to decide on how many reps you want to do so you know how much work is done. When you do an exercise, one repetition takes about 3 seconds on average. So, if you are putting this in perspective and do the circuit for cardiovascular training how many repetitions do you want to get? Above 15 because 15 reps x 3 sec/rep = 45 seconds. 45 seconds plus 10-15 seconds of (transitional) rest = 1 minute interval. Now, if you look at the 1RM percentages (Resistance Intensities Summary) then 50-60% of 1RM allow you to do 20 repetitions or more. So, that’s why you should be using 55 – 65% intensity (15 – 25 reps) for resistance exercises so you can train more tissue in a circuit and I also target proper muscle balance. You don’t really want to do more than 25 repetitions because then you get beyond what the actual necessity is. For “caloric expenditure” & “reduction in mass” the repetitions need to be higher because intensities need to be lower, otherwise you produce too much lactic acid. So how many reps do you like to see? 15 to 20 reps. 15 reps will translate into 45 seconds (15reps x 3sec = 45). Then you want to shoot for rest intervals of 10-15 seconds (often considered transitional rest). So, a circuit of 8 exercises with 20 reps at 50% of 1RM will amount to 8 min of work (20 reps x 3sec x 8 exercises = 8min). If we have 15 seconds of max rest then we get (15 seconds x 8 = 120 seconds = 2 min) a total of 2 min of rest. Therefore, the entire tennis training circuit will last 10 minutes. In this section we provide you with some more workouts and training tips you may be interested in to optimize your training and you can Download the Circuit Training Workout!